Yes I know it’s been forever and lots of promises. Time and I don’t seem to be the good friends we used to be. WE ARE 2 AWAY FROM THE LAST OF THIS ROUND OF LETTER STUDIES!!!! 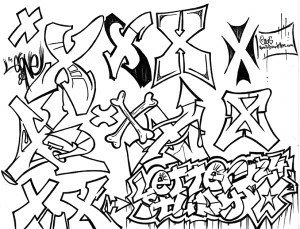 Anyway, here she is, the long anticipated page full of the letter “x” in numerous graffiti styles! This letter is a tough one. Not because it’s difficult to draw because X is one of those letters that is distinguishable from all the others no matter how you represent it. It’s a tough one because it IS so distinct from all the other letters. I don’t use it often and when I do, it’s usually accented in a way that it becomes the focal point of whatever word I am creating at the time. It’s very easy to lose this one in the mix when trying to incorporate it into a heavily styled piece. It’s simplicity its both its blessing and its curse because it can easily be lost in the mix and become what looks like a decoration for the letter before or after. As with all of the letters we’ve covered so far, the key is practice. Make pages and pages of each letter by itself as the more you study on a letter and focus on its form, the more you will start to understand the function and expressive nature of the shapes as they were intended. 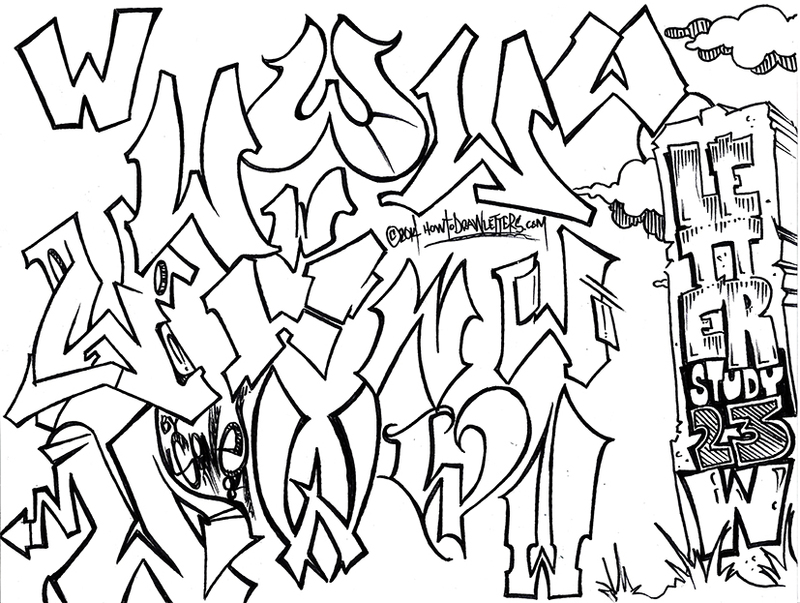 The beauty of graffiti art is the fact that the letters serve multiple purposes. The obvious is in that they form words, but the one most separation between the practitioner and the master is the fact that the words create form. It’s easy to bundle a bunch of letters together to say something, but when you get them working together in a style that is unique to you, THEN you have something. More coming soon. Thank you all for the great feedback, I am glad this page is serving a purpose for all of you! 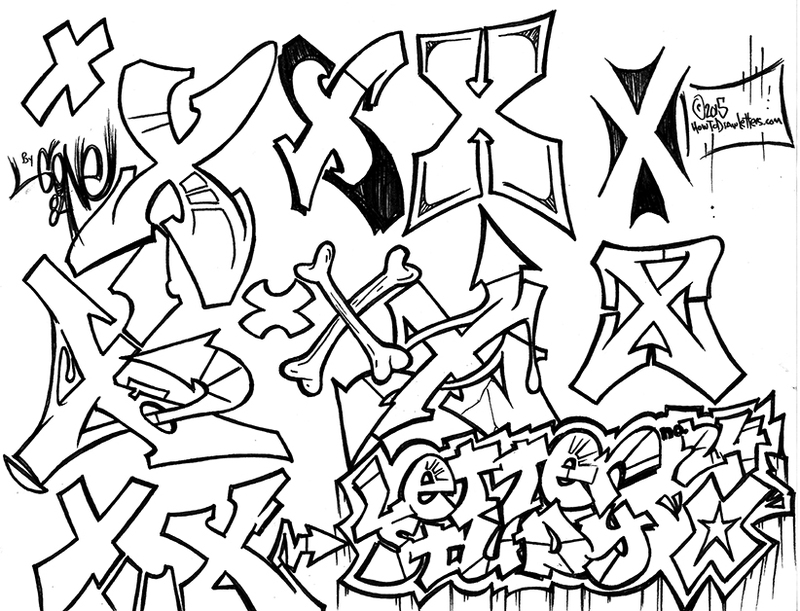 Coming soon, how to draw more graffiti letters! The Gone84 doing what he does best! I know it’s been awhile and while you’ve been seeing cosmetic changes to the site, I haven’t posted the next letter in our series. It’s coming, I promise. I have moved to another state and haven’t had a lot of time to play with this thing. On the upside though, I am finally transplanted and despite my perpetual unemployment issues, I should have the the eagerly awaited graffiti letter X up for you soon! 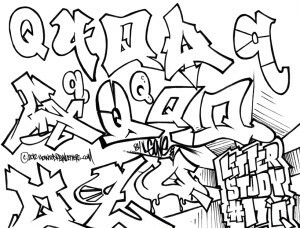 I have also started reaching out again for guest writers to throw me some graffiti alphabets, tutorials and techniques so that you have more than my view on the subject to learn from. 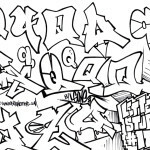 If you are a seasoned writer or someone with some expertise on the subject of not only graffiti lettering but lettering in general, drop me a line through the contact page and let’s see what you’ve got to offer this new generation of the graffiti community! I am more than positive that your work will be appreciated by the rest of our visitors! 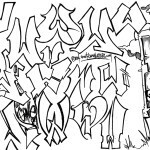 Well boys and girls, here we have the next installment, the letter W in graffiti styles! Here is a letter that you would think is as simple as turning the letter M upside down and sometimes that might be true, but somehow usually not. The letter W, you will find, is very worthy of your practice as it will present a challenge that you may not have expected. It’s very easy to lose the character of this letter entirely if you aren’t careful, but done with form and function in mind you will find yourself in charge of a very effective and powerful letter! The trick is keeping your head in the game and not just blowing it off for the next letter in whatever word you are working on. Don’t limit yourself to the standard on this one. Extend the middle to be higher than the two lines on either end, round off one or all three points, incorporate some overlapping. The point is to let yourself go a little while still keeping the form of the letter intact. It’s tough and will require more practice than most of the other letters did, but so very worth the effort. I promise. Well here it is. 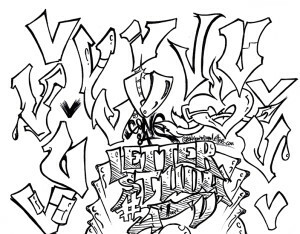 The letter “V” in multiple graffiti styles. How hard can it be? It’s two lines that meet at an angle, right? Well you will find that this one is going to require some serious practice to get right! Sometimes the simplest letters are the hardest to put style on without making a mess. In my opinion, its best to stick with the simpler style of it and I usually do. But plenty can be done with it if you work it for awhile! As always, the rule here is practice. Lots of it. Don’t copy, draw inspiration. There’s a huge difference. Keep in mind that the name of the game is RESPECT and you’ll get none of that showcasing someone else’s artwork as your own! Hey all! Yes I know it’s been a long time. I’ve been doing lots of things! 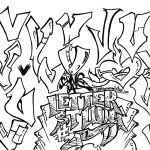 The next letter will be coming up soon as well as a few more surprises. In my absence I’ve started a new business, created an antiques and art store, and got a new clothing brand going! So yes, I’ve been very busy. I’ve started a new brand called Career Criminal and have moved most of the operati0n over to Spreadshirt for now due to their decent pricing and excellent options for design placement on their gear. I only wish they did all over tshirts also because then I’d be totally sold. I’ve ordered a shirt or two from them and am very impressed with the quality and turnaround time. I see this becoming a very good partnership. 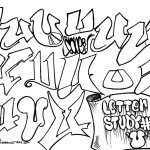 Look out for some HowToDraw Letters tshirts soon as well! I had the lettering done all the way to “Z” and actually had a couple sheets of each to choose from, but the winter brought with it some horrible things. I had three water pipes burst in my home office all at once….ALL OVER MY DESK!!!!! Yes, the pieces got ruined. So it’s literally “Back to the drawing board” and I have to re-draw each and every page. Unfortunate, but a minor setback at best. 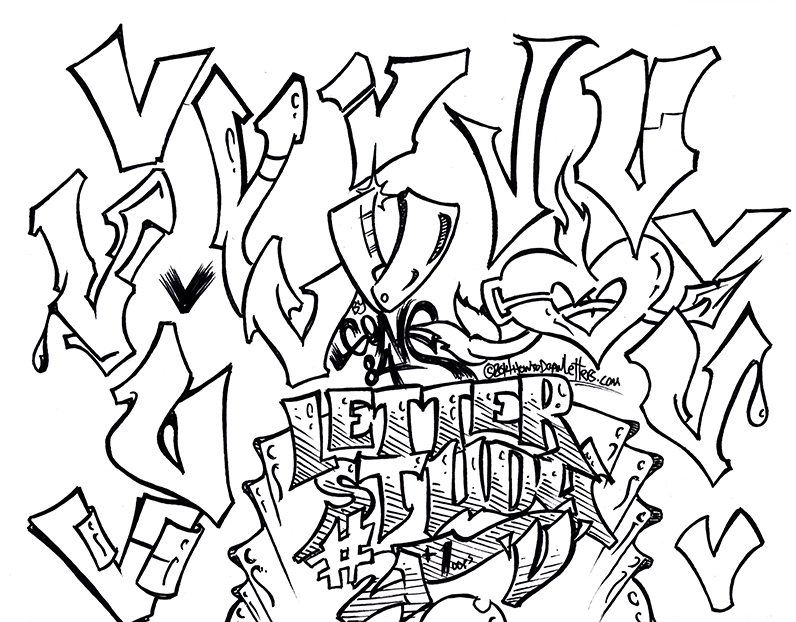 Expect more letter studies soon and some other tutorials coming right behind them as more than a few people have asked for more than just inspiration, but actual lessons on how to do this stuff. 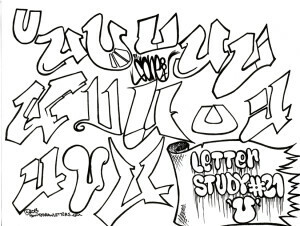 Here we have the 20th installment in our Graffiti focused Letter Study series which means we’re almost ready to move on to newer and more in-depth lessons!! We haven’t even started yet, believe it! 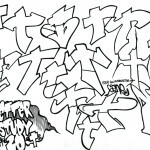 Today we have the graffiti styled letter “T”. On this one I would like to add a side note that while there are a million ways to make any of these letters to include this one, letter “T”‘s real versatility comes when attached to other letters and the way that you choose to attach it. At this point in the alphabet I’m confident that most of you have at least enough examples to write your name so I would suggest that while still practicing your letters and developing a style that you work toward multiple letters at a time. No need to make words at this point, but seeing how certain letter combinations look together will go a long way toward developing typography skills in any type. 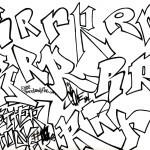 Keep in mind that even as a street variety of art, graffiti art will always adhere to certain design elements. 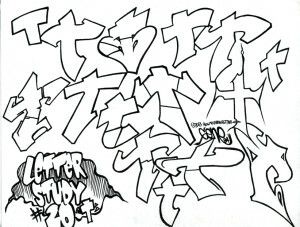 It’s not as easy as slapping a bunch of letters together like i do in these studies. More on that later. Enjoy! Hello again fellow travellers! 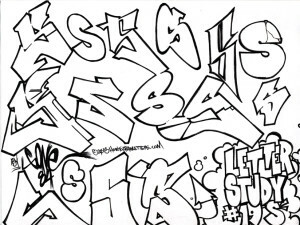 Today we have for you the 19th and VERY much awaited installment in our letter studies, the ever popular letter S in graffiti style! I don’t think I have had as many requests for a single letter so far as this one. The funny thing is, it’s probably one of the easiest letters to make! Very simple shapes, very simple structure, the letter S is another of those many favorites that a graffiti writer just LOVES to spend time on. Don’t believe me? Just take notice of how many writers’ tags start with this fine letter! Not much else to say about this one really. The freeform structure and effortless flow of this letter allow it to stand alone from all the rest. So much fun to be had with this one so, like every other letter I’ve shown you so far, practice it like mad until you get something that you can call your own. It is so easy to manipulate this letter while still retaining it’s value and identity that almost anything goes…… almost. Sorry for the delay, been out and about being an artist! HAHAHHA. 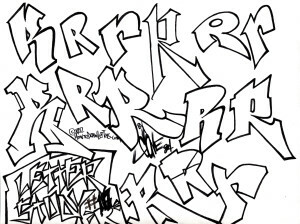 Anyway, here we have the eighteenth installment in our graffiti letter studies, the amazing letter R! This is another of my all time favorite letters because it’s so fun to mess with. Very simple when done simply but can be really turned out when tweaked and twisted. It seems to me like most writers I know really get into drawing this letter for the same reasons I do. The most commonly used letters in the alphabet often become signature letters of the artist creating them and this one is no different. Work with it and its unique structure until you have something that is identifiable as your own and no one elses’. Everything else tends to fall into place style-wise once you master these common letters. As with everything, practice is key so keep it simple and keep on practicing! Bet ya weren’t expecting this one so quick! Oh yes, it’s another one of those perceptively tough letters that really aren’t as tough as they seem once broken down. Letter Q is simply an O with a line sticking out. How hard is that? That little line affords us so very many possibilities and variations that this letter is plenty of fun to work with and can become a big challenge when trying to arrange new styles! 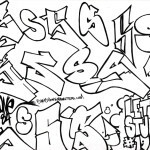 It can be made to fit into everything and really can be a game changer for the aspiring graffiti artist. Practice this one, practice it frequently and obsessively. Have lots of fun experimenting but make yourself work for a unique result. 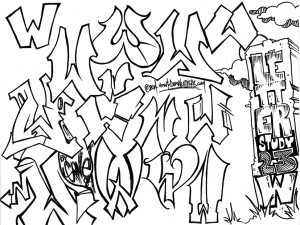 Keep in mind that you are pursuing a great tradition in not only graffiti as an art form, but in what is really the LAST vocation that revolves SOLELY around handwritten typography. Even sign painters are using computers these days! Our reputation is in the skills that allow our hands to express our minds to an audience that likely didn’t ask for what we have to share with them but as a majority are finally coming to the point that they recognize it as art. This is where it all begins so practice this, learn how the letters work both alone and together. We are almost at the end of our alphabet and will soon be ready to advance to the next phase of our learning. Enjoy!